"I felt two hands grab my arms - and they were icy cold, "
The USS Olympia is an intriguing water vessel that is currently located in Philadelphia Pennsylvania. While there are many haunted places in Pennsylvania, there are very few reports of haunted ships. This is one reason why the USS Olympia has started receiving so much attention from those that engage in paranormal investigations. Throughout history, many stories surrounding haunted ships have emerged. While it is true that there are many legends and myths surrounding many water vessels, it is important to understand that within every legend and within every myth, there is a certain degree of truth. This is especially true when those legends and myths involve the living and their personal experiences. Throughout this article, you will be introduced to the history of the haunted USS Olympia and the ghostly stories surrounding what is now deemed as one of the many haunted places in Pennsylvania. Once the ship arrived in the City of Vallejo, final touches were made to the body and mechanics of the water vessel. By the time that April rolled around, the ship was ready to have a little fun. It has been established that during this month, the ship was sent to the City of Santa Barbara for a special festival. In the same month, the individuals that were part of the crew performed many different types of drills. However, on the 20th day of April, the haunted USS Olympia saw her first tragedy. It occurred when there was a gun practice was in place. An accident occurred and a man by the name of John Johnson was killed. Despite the fact that this was the first tragedy to occur on the ship, it still continued its journey. Eventually, the ship returned to the City of Vallejo and acted as a replacement to the ship known as the “Baltimore” as the official flagship of the squadron identified as the “Asiatic”. 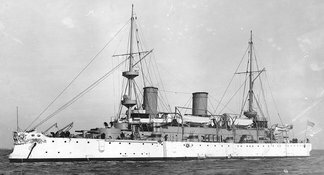 Many speculate as to whether or not the water vessel was known as the haunted USS Olympia during this time because of the death that had occurred during gunnery practice. On the 25th day of August in the year of 1895, the ship was instructed to set off to the waters of China. Unfortunately, she got docked in Hawaii just one week into her travels because of the fact that a deadly outbreak of the condition known as cholera occurred. However, on the 23rd day of October she was permitted to continue her journey. By the 9th day of November, the USS Olympia had arrived in Japan in an area known as “Yokohma”. By the 3rd day of December that year, she was sailing the waters again. On the 18th, an individual who was known as a “Rear Admiral” named F.V McNair took command. He mostly engaged in a wide variety of training exercises and even did several visitations to countries such as Asia. 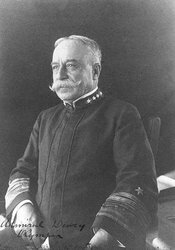 On the 3rd day of January in the year of 1898, a Commodore by the name of George Dewey took command of the Asiatic Squadron. On the 25th day of April later that year, the declaration for the Spanish-American War was officially put into place. Within two days, the ship was ordered to travel to the Manila region of the Philippines in order to capture Spanish ships. If they were unable to capture the water vessels, they were instructed to completely sink them. The fighting against the ships took place on the 1st day of May in 1898. It was found that both the Spanish and the Americans walked into the battle a little unprepared, but the Americans achieved the highest level of success. The Commander as well as the USS Olympia was hailed as the “First Victors of War” that day. That is the day that the USS Olympia became extremely popular in the United States and abroad. On May 20th, the victorious water vessel returned to the waters of China and within one month, the ship set off to return to the United States. On the 10th day of October, the USS Olympia returned to the United States – arriving in Boston that day. 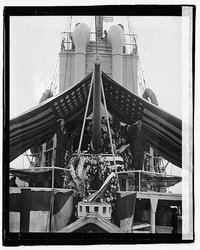 It was then that the vessel received a new paint job completely with an ornament identified as a “Gilded Bow”. On the 9th day of the following month, the victorious ship was officially decommissioned. It was then placed in a special location for reserve. In the first month of 1902, the water vessel was recommissioned and ordered to the squadron known as the “North Atlantic”. The ship was responsible for watching the Mediterranean as well as the Atlantic Ocean. However, in April of the year 1917, the United States elected to join the battle of World War I. It was then that the ship was positioned as the flagship of the force known as the “US Patrol Force”. It was the ship’s responsibility to watch the eastern region of the United States and protect it from ships from Germany. In addition to this, the USS Olympia assisted in escorting other water vessels through the Northern part of the Atlantic Ocean. From the year of 1917 to the year of 1922, the USS Olympia successfully performed many different duties for the United States and the military units of the nation. One of her most notable deeds is traveling to France and returning the remains of the individual known as the “Unknown Soldier” to the United States. In 1921, the guns from the ship were shot in a final manner. On the 9th day of December in the year of 1922, the USS Olympia was decommissioned in Philadelphia Pennsylvania and officially placed in reserve – and continues to remain there to this day. Little did anyone know at the time that she would soon be identified as one of the most intriguing haunted places in Pennsylvania. •	A man that volunteers on the USS Olympia by the name of Harry Burkhardt shared the fact that he felt someone grab his arms in the boiler room region of the ship. He claims that the touch – which felt like two hands – was extremely cold and that there was no one else in the room that could have done this to him. •	A visitor to the USS Olympia by the name of Melissa Miller claimed that when she was in the engine room region of the ship, she watched the manifestation of an apparition that had a full body appear in front of her. •	A worker for the USS Olympia by the name of Chris Hall was informed by many guests that they witnessed the appearance of a man that was translucent in nature appear in front of them. •	In the boiler room, a female voice has been heard saying “I think he is ok” and this apparent female spirit also seems to laugh occasionally. •	A dark shadow has been observed in the engine room. •	A man in a suit has been seen in the corridor at the rear section of the ship. During an investigation regarding this eye witness account, a man’s voice was picked up on an EVP recording as saying “I think I’m in Love”. •	Voices yelling “Get Out!” have been captured and heard. •	A man has been observed walking around in a white navy uniform and has been seen disappearing. •	In one instance, a voice was documented in saying “Save the Ship”. If you are interested in haunted ships, you will find that the haunted USS Olympia is quite appealing. It has a rich history and has faced many different conflicts and tragedies. Many individuals throughout the history of the boat have lived and died on the ship. There are many experiences and events that account to the fact that it is one of the most haunted places in Pennsylvania. Despite the fact that the boat is in jeopardy of being scrapped due to the fact that there is no funding available to preserve the water vessel, it plays an important part in the history of the nation. Until recently, many have been nervous to come out and share their paranormal experiences with this haunted ship due to the fact that they did not know how the public would view them, but with the growth of interest in haunted places to go around the world, more and more are sharing their stories. As a result, the haunted USS Olympia has more to offer than just history, there are stories still waiting to be expressed to the living through the deceased.